I love it when I’m traveling and a familiar restaurant or coffee shop, as in this case, puts a location-specific item on their menu that you can’t get anywhere else. 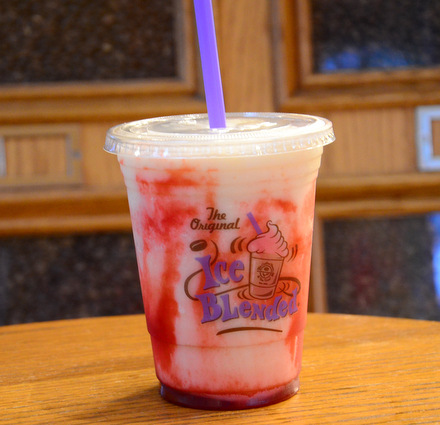 On a recent trip to Hawaii, I stopped in to the Coffee Bean for a quick refreshment and was surprised to see that their menu included lots of local flavors, such as Li Hing Mui (spiced plum) Iced Tea and Lychee Iced Tea. If I had had more time, I would have tried to sample each and every one of them (the Li Hing Iced Tea was amazing), but one that really popped out at me was Coffee Bean’s version of a Lava Flow. A traditional Lava Flow is a pina colada that is mixed with strawberry puree, giving it a pink and white swirled look that just might remind you of red hot lava. Coffee Bean’s version didn’t include the rum that the cocktail version does, but it was better than most Lava Flows I had at bars on the island. The drink starts with a pineapple and coconut blended base, which was creamy and very flavorful. A few pumps of strawberry syrup were swirled in just before the drink was served, giving the drink the perfect pink and white color combination. The strawberry syrup was fairly sweet, but the combination was right on and the drink was a fantastic way to cool down on a hot Hawaiian afternoon. I’d love to see this drink – and the Pineapple Coconut Ice Blended base – end up on menus on the mainland one of these days! If you’re visiting the islands, be sure to keep an eye out for this delicious drink.